Our company aims to build and strengthen our clients' brands, e.g. on pharmaceutical and IT markets. Knowledge, experience and creativity combined with engagement and skillful work coordination of the whole team makes realization of our projects highly effective. In our company we understand quality as a perfect fit of all these elements tailored to our costumer’s needs. We offer complex educational solutions that will increase the competences of any occupational group. From theory to practice. We use on-line and off-line tools. We develop web platforms that are complemented with workshops and webinars. Their users may enroll for workshops, watch videos and participate in exercise activities. Our offer is addressed to clients aiming at increasing the professional competences of any group of individuals. VINCI EVENTS is a web platform that facilitates efficient organization and management of conferences. It was developed on the basis of our long standing experience in organizing educational and scientific events. VINCI EVENTS allows to efficiently design, implement and monitor each stage of the event. What's important, it allows to gather and process info and opinions about the particular event. This data leads to improved conferences which in turn generates higher attendance rate and greater participant satisfaction. by clients who purchased the license and use the software on their own. 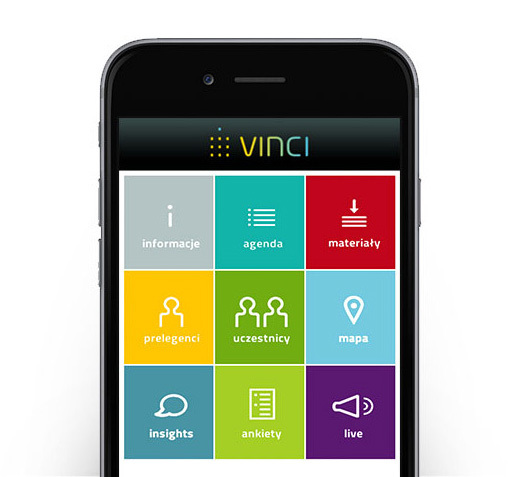 Vinci Events comes with a mobile application for the participants - Vinci Mobile. It allows to access information about the event, such as the agenda or the list of speakers. It also allows to organize a contest during the conference and receive feedback in the form of questionnaires. As one of few companies in Poland, we organize expert events that combine the highest quality content with a very attractive setting. Thanks to a long-standing cooperation with top quality experts we can recommend lecturers who are renowned authorities in their fields. The program of the events for doctors and pharmacists is carefully chosen, allowing to gather a large number of educational points. Expert events are organized in a complex manner: starting from unique concepts and strategies, through the design process and ending in professional implementation supervised by a dedicated team of specialists. Thanks to our long standing cooperation with domestic and international facilities we can offer accommodations that allow to combine education with entertainment. We know that organizing a good training session requires attention to details. We are aided by an innovative system, VINCI EVENTS, featuring numerous flexible functionalities. It allows for the management of conferences, including online registration of participants. We run our business to help you deliver your results! Are you looking for consistent, compliant, customized and quality HR Managed Services solutions to leverage your HR processes and business? Do you want to align your HR function to your organization’s business strategy and get the best from your people? S&P Partners responds to Our Clients needs by handling dedicated HR Managed Services functions. We offer complex HR outsourcing and manage the full life cycle of the employee’s - starting from sourcing & recruitment, through onboarding, mentoring, performance & talent management and professional development. It allows the Client’s company’s core resources focus on strategic initiatives and growth than managing transactional activities in HR operations. We support businesses to achieve their goals through the effective selection, management, engagement, measurement and reward of employees. Responding to your current business need, we offer various types of engagement: Temporary, Permanent, Temp to Perm and Freelancing. What makes us unique? We know how to find, assess, hire & engage, manage and track third-party employees and integrate them into Client’s workforce. We all are in a global world, thus S&P advices our client where to locate the business and attract the right competencies and skills. New technologies and globalization allows to deliver work remotely from various geos. Our clients are local, international and global. We serve them worldwide, carefully applying our consistently developed solutions to their local and international business circumstances and conditions. We want to approach and engage the best individuals no matter where they are located in the world, in line with local laws and helping you stay compliant, so you can focus on your core business. We are engaged in Corporate Social Responsibility activities and also look for individuals that would participate in CSR activities of our clients. We carry out projects in Poland and across Europe. One of such projects was directed at school pupils and students. It consisted of planning and implementing an information campaign for the participants (e-mailings, telemarketing) and establishing long lasting relations with them. We are among the few that have successfully worked with the most demanding target groups in marketing - doctors and teachers. We made it happen thanks to highly experienced consultants who established methods that allow them to communicate with every participant individually. This leads to long and lasting relations. A big challenge, successfully completed! Creating loyalty is the most basic and, at the same time, the most difficult aspect of marketing. Thanks to our great experience and innovative, original tools our team has built long lasting relations with many groups of specialists and experts. How did we achieve such great results? By combining loyalty programs with gamification and competition which make the participants even more motivated. Desk research – data analysis on the basis of available sources. PAPI (Paper And Pencil Interview) – classic, paper questionnaire. A popular and effective method for gathering quantitative data. CATI (Computer Assisted Telephone Interview) – phone interview based on a survey. Quick and cheap. IDI (In-Depth Interview) – detailed individual interview. Essential for gathering "soft" data. FGI (Focus Group Interview) – A discussion with a selected group of experts allows to gather valuable qualitative data.